We decided we wanted to explore a 4×4 road up to Crater Lake, just South of Lake Tahoe. We’ve taken the Jeep up there and our snowmobiles in the winter. It’s steep and twisty, but we figured that if the Jeep could make it we would probably do fine on the motorcycles. 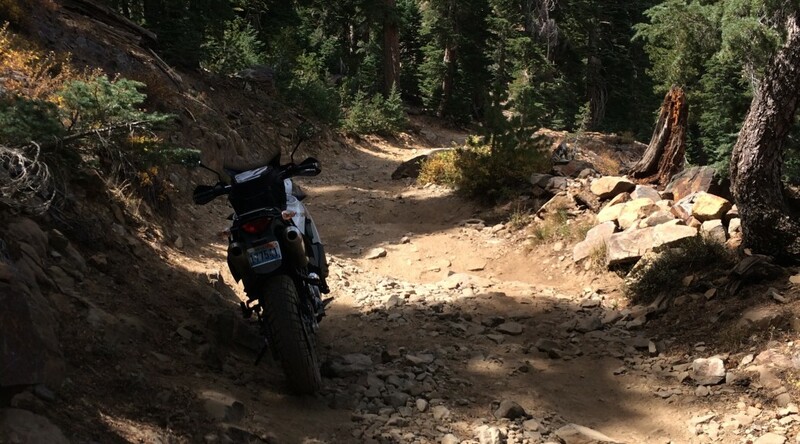 Maybe not the best of assumptions as four wheels are a lot simpler to manage over ruts and rocks than two. That’s when John’s 450 lbs BMW 1200 GS bounced off sideways and he dropped the bike. And it of course landed square on a rock cracking the engine case so the oil ran out. I felt so bad. And at the same time I knew that if I had been first, I would have been the one dropping the bike instead — the road was way too rough to ride. I think we were so determined to just go that we wouldn’t stop and assess the situation when things got bad. Next time we’ll be a little more realistic and remember that just because we think we can, it doesn’t mean that the circumstances will let us make it. Previous Post“Did you check your oil?”Next PostFinally! Some rain.